Do you have any good Nurses Week traditions? We have one, it’s delicious, and it’s all for you! For five years now, we’ve been sending free pizza to nurses during Nurses Week. Back in 2013, we sent 76 pizzas to 194 nurses at 14 hospitals across the U.S. In the years since, we have sent pizza to nearly 1,000 nurses! We are very happy to continue the tradition this year. Every day this week, we’ll be sending out pizza to nurses. That could be you and your team! 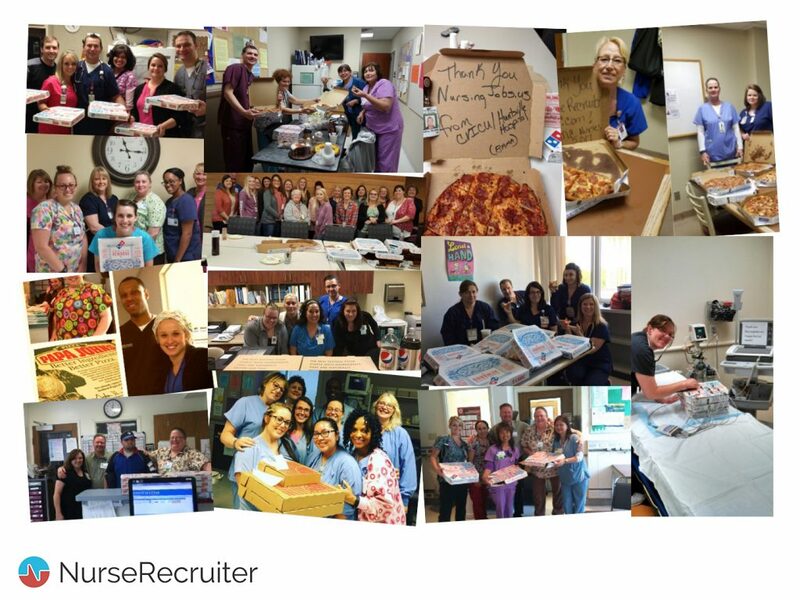 Photos from a few NurseRecruiter Nurses Week pizza parties over the years. Would you like free pizza for you and your colleagues this week? We’ve made it easier than ever. 1. Like us on Facebook or follow us on Twitter to qualify. 2. Every day this week, we’ll post a free pizza announcement on both Facebook and Twitter. 3. Post a comment there telling us the name and location of the hospital or medical facility where you work (United States only, I’m afraid), and why you could really do with some pizza right now. 4. That’s it! Every day we will select who wins a free pizza lunch or dinner for you and up to 12 of your coworkers! (If there’s more of you and you don’t want anyone left out, let us know and we’ll see what we can do.) We’ll send you a FB message or Twitter DM to arrange the pizza delivery. We also made a handy form you can use to request pizza and let us know where and when to send it. We hope you take pride in the achievements you’ve made over the past year, because you are awesome! Happy Nurses Week! Not a day goes by that I don’t get a loving comment, or gesture from one of my patients or fellow staff members. I witness such love and friendship between employees, such as “I bought this because I know you’ve been looking for one!”, or, “Good morning, Baby, have a great day!”. “You’re a wonderful nurse”, She’s a cool nurse”, “I’m glad you’re her!”… The consistency of the outpouring of love is such that in my 11 years as a nurse have never seen, ANYWHERE! Thank you for appreciating nurses all around America! I appreciate the kind gesture of giving out free pizza and I hope you choose us to send some love our way! Oncology nurses burn out after 2 years, I have been in the department for 17! I think what makes my job easier is having great teammates! We go through the ups and downs together, always. We celebrate cures and mourn losses together. I am blessed! We work hard everyday to make sure our dialysis patients are well taken care of. It’s a tiring job buy we love what we do. A pat on the back lets us know that we are appreciated. A pizza thank you would really be great way to make our day! Thanks!! I cannot WAIT until the patient:RN ratios decrease. 7-8 patients is too damned dangerous! Thanks for the support of all of us, and for the Nurse’s Week pizza opportunity! Thank U for celebrating us nurses. I would like to celebrate our staff for their deficiency free surveys by giving them a pizza party! CVICU at banner Boswell is one of the most busiest unit in banner Boswell, and the nurses at this unit would always go above and beyond to care for their patients. It has always been a privilege working with those amazing nurses at CVICU. And yes! We deserve a free pizza🤓👍❤️👏. Because nurses cares. Open Arms Health Care Clinic has a great group of nurses that really care about the patients! WE work hard everyday just because it’s the right thing to do and we love our jobs. Thanks for the appreciation!! I thought the floor was the only place I would find great patients but I can’t describe the impact clinical research patients have on my day! It’s so amazing to see patients benefit ahead of conventional medicine! Our team at Fairlane ambulatory surgery do our best always. We are a very close knit family and we rely on each other. We do our best every day. We have about 38 in our group. Our group is made up of RNs, surgical scrubs, nursing assistance, secretarial specialists, and environmental specialist. We all depend on each other as a team. The nursing staff here at Bluff Plantation is awesome!!! There isn’t a day that goes by that each member doesn’t give their all to ensure the best patient care is accomplished on a individual centered basis. We would really appreciate some pizza love!!!! I work with the best team of nurses! We are all a team, no matter what! There is no drama or cliques. When u r a team u work together! We stick together and support each other. It’s just what we do! It works! Can’t forget the rest of the team (Dr’s, Emt, cnas, housekeeping, security, registration, radiology, lab and pharmacy..) without them I couldn’t do my job. I need every part of my team to take care of the patients that look for our help! Nursing is a calling and should be appreciated for the job they do rather than those in leadership positions always finding out faults. Everyone has faults if placed in the same position. I work at San Martin for Dignity Health in Las Vegas, Nevada. We are a baby-friendly LDRP unit and do a phenomenal job of caring for the whole family! We love our unit and our patients. Dignity Health is so involved in the community. They partner with many worthy causes. When they hired my disabled daughter through their partnership with Opportunity Village, I actually switched hospitals so I could work for this amazing company. This would be awesome for the staff i work with. We work nights on the weekends and it is tough getting to the other events that re scheduled for the day time. WE do however try and hold the fort down when all others have left for the day. I am a NA on medical unit, it’s a very busy and crazy floor. We sometimes are so busy we don’t get a break or eat so fast just to get back and do it all over again. We get hit, scratcbed, but called names and told where to go. We all deserve a pizza break. We rush back to our patients just so we can hold hands with them while they pass and cry with with the family’s. We go home late and exhausted just to start this over again the next day, but we wouldn’t change jobs for anything. I’ve moved around a lot in my nursing career but there is nothing like working in oncology. My coworkers and I give out our cell phone numbers and allow patients to reach us even after hours. These patients are our family and we treat them as so!